Every other Wednesday in Cool Takes, S. D. Kelly offers a fresh reflection on hot topics by exploring the intersection of faith with high and low culture. Donald J. Trump is the presumptive Republican party nominee for President of the United States. I am tempted to think, staring at the image (one that is now everywhere among us: in print and on our screens) of Trump’s flaming face and tawny mane, that the apocalypse is upon us. These United States are at the edge of the abyss, ready to topple into the chasm of a despotic Republic, as opposed to humming along as the nicer, tamer democratic Republic we have so long enjoyed. Twitter confirms my fears. 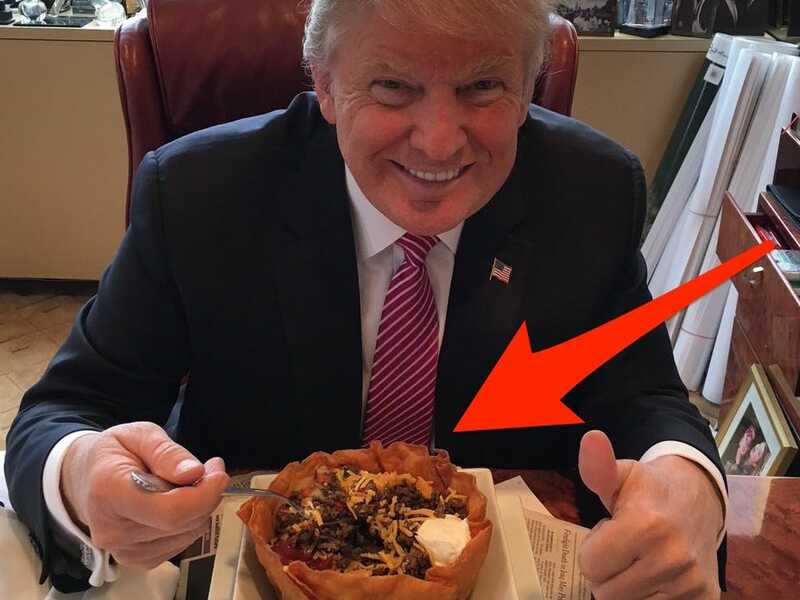 Donald J. Trump, known around those parts as the @realdonaldtrump, releases a steady stream of tweets that range from vitriol to slander, with the occasional break for tweets that are only mildly insane–fueled by lesser episodes of acid reflux, smaller taco bowls no doubt. The only stable time any American remembers is the time before this one, which has more to do with false nostalgia and historical ignorance than anything else. I muse at the edge of this precipice, the End of America, you might say, before stepping back to consider our history as a nation. I remember: the apocalypse, in one way or another, has always been upon us. This country was founded by mobs, for mobs. The nature of democracy is ever thus: let the people loose until they run amok. This usually takes about twenty minutes or so, depending on how long it takes to find torches and oil-soaked rags. Over the last few centuries, the saving grace of the United States has been the rule of law. Here, we give a shout-out to John Adams (and David McCullough, who wrote a wonderful biography of him), the original policy wonk, a man toiling in the slender shadow of Thomas “Fancypants” Jefferson. John Adams & Co. created a foundation of governance built on law, sloganeering tempered by legislating, the mob preempted–no matter the direction in which it rushes. The executive branch, Lord willing and the creek don’t rise, is balanced by other branches of government. These other branches are filled with politicians free, not of vice, maybe, but at least of spray tan in shades of burnt umber. That hue is reserved for the Oval Office alone. Consider this: in the 19th century Andrew Jackson, as part of his rise to the White House, killed a man in a duel because he accused him of cheating on a bet in a horse race. Apparently, this duel was one of many. Jackson was a man given to conflict: war and rumors of war, killing directly and indirectly. While in office, Jackson instituted the removal of the native population, sending tribes across the continent in a death march, relocating and herding them into arbitrary geographical pens, like cattle. Jackson eradicated thousands of years of pre-European human history from the face of America. It would be hard for any President to top that in terms of domestic policy. The Trail of Tears provides just one of our many national apocalypses. We faced a civil war, one which flayed entire regions and nearly pulled the Union to pieces. We have seen the specter of slavery, which haunts and haunts and haunts again. And now, one hundred and fifty years after we stopped killing each other legally, things are bad in other sorts of ways. We have exterminated billions of passenger pigeons and are in the process of ridding ourselves of honey bees. We make a practice of paving over arable land to make way for various iterations of Home Depot and Walgreens. Americans are riddled with opiates and credit card debt–apocalypses of an ephemeral, yet all too real, sort. Economic Depressions, chasms between the rich and the poor, ebb and flow with the rhythm of the tide. Stability is a notion that has no basis in reality. The only stable time any American remembers is the time before this one, which has more to do with false nostalgia and historical ignorance than anything else. Maybe the only thing that sets Donald J. Trump–the central player in our current apocalypse–apart from many of his predecessors is that we see how awful he is. With every tweet, every post, every recorded word that falls from his ample lips, we experience Trump. We know his visage, his cadence, his multi-debate schtick and his stump speech intimately. We have seen his pores in HD, and they are filled with pancake makeup, the skin smoothed to make way for the all-seeing eye of the camera. Andrew Jackson’s constituents were not privy to his receding gums, nor visual explorations of his thatch of hair. They did not see his rages, the hurling of ink pots, the demands that a lackey burn down the offices of an opposing newspaper, the one offering a ceaseless newsfeed of anti-Jackson propaganda, each word balefully typeset by his enemies. Had Jackson lived in our own time, he could have been as much of a Reality TV star as any other chump. Jackson’s inauguration was the most Trumpian event one is likely to find this side of the 19th century. Contemporary accounts tell of the White House being overrun by people, regular folk in homemade clothes, surging inside the house in thrall to the man who told it like it was. A few plates were broken in the process, the crowds finally lured outside the White House by tubs of drink placed on the lawn for that purpose. This same tactic is handy in mollifying unruly livestock; Jackson was not known as King Mob for nothing. It is too bad Twitter didn’t exist in 1829. King Mob would have made a perfect handle. Trump may be worse than any other politician; America may truly be at the edge of the precipice. It’s hard to tell from here. It’s hard to tell at any point in the history of a revolutionary nation: are we in decline? Or is the real revolution yet to come? I don’t know, and neither do you. Right now it looks as though it will still take a lot of doing to undo the good, on balance, that the Constitution has laid as a foundation for the people of these United States. If he becomes President, the realdonaldtrump (whoever he turns out to be), will do his thing, and it will probably be horrible. Americans will survive, and live to riot another day, at least until Jesus comes back and makes all things new. With that in mind, keep your dueling pistols handy and your eyes scanning the skies on the way to the voting booth. As an American, you don’t want to be caught flat-footed when @therealapocalypse finally, definitively, darkens the atmosphere. S. D. Kelly lives with her family in coastal New England where she writes and works with a local nonprofit. In Making All Things New, David Powlison is realistic about the fact that sexual brokenness is often wider and deeper than we initially surmise.